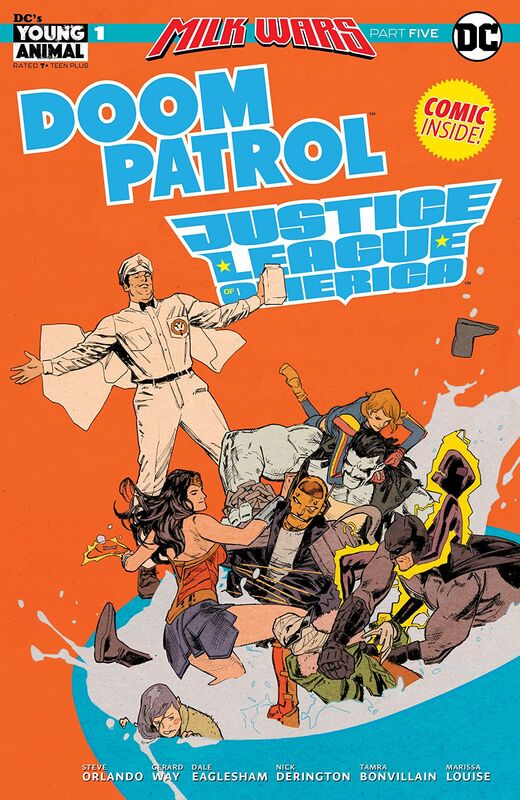 Doom Patrol/Justice League of America Special #1 Review: Milk Wars ends here! – AiPT! Doom Patrol/Justice League of America Special #1 Review: Milk Wars ends here! Milk Wars comes to a close as all the pieces fall together. Welcome back to MILK WARS! This is what it’s all been building up to! The grand finale! Finally placing every member of Young Animal in one place and throwing in the Justice League of America and Wonder Woman while they face off against the evil Ret-Conn and their mascot, Milkman Man! Gerard Way and Steve Orlando write a fantastic conclusion to one of the best self-contained events in years with amazing art through the majority of the issue by Dale Eaglesham and an epilogue by Nick Derington. Doom Patrol/Justice League of America is the perfect blend of all the previous issues of Milk Wars and a culmination of Young Animal. Each issue has been wonderful and captures the spirit of the weird imprint perfectly. Having been introduced to Shade through this event has always made me want to go back and read her solo series and wish to see her newly relaunched ongoing. Overall, Milk Wars has been fantastic and one of my favorite events ever done by any publisher. I haven’t talked much about Eternity Girl by Magdalene Visaggio and Sonny Liew throughout the previous issues as I personally didn’t think there was an amazing amount to talk about. The way they introduced this new character in two page backups in a total of eight pages in four issues was nice as they also set it up as if she was a longstanding character. This issue has her enter the DCU through the events of the issue, only appearing in two pages maximum which I was slightly sad about. I thought she’d be part of the event instead of them using it as a backdoor pilot almost for the character. The art team throughout the book is fantastic; Nick Derington (who did the epilogue) was amazing as usual and the primary artist Dale Eaglesham was phenomenal. I’ll end with a message that I read in a review of previous issue of Doom Patrol and I think rings true here too. Like with Doom Patrol, Milk Wars is a series that isn’t really able to be reviewed in a meaningful way. It’s more of an experience that has to be read yourself. One thing I can do is recommend this book to anyone who enjoys the weird side of comic books. Do yourself a favor and go out and buy Doom Patrol volume 1, Doom Patrol volume 2 (when it comes out in May) and any of the other Young Animal books that catch your eye as well as all five issues of Milk Wars. Hell you could even just solely pick up Milk Wars, decide which characters interest you and go back from there. Young Animal really is an imprint that needs to be experienced. A fantastic issue from a fantastic event. One of the best events done in recent times with no forced tie-ins from other books. Way and Orlando write an absolutely fantastic issue to round off a fantastic event. Phenomenal art from a great art team of both Derington and Eaglesham. Young Animal continues to be the weirdest and most wonderful books out there.